Myanmar's Vice President Myint Swe, a former general, will move into the role until a new president is in place, according to the constitution. Yangon, Myanmar: Myanmar's President Htin Kyaw resigned suddenly on Wednesday leaving the country's de facto leader Aung San Suu Kyi without a close confidant and political ally as she faces rising international opprobrium over the Rakhine crisis. The president is an old school friend of Suu Kyi, serving as her proxy in an office she was barred from occupying according to Myanmar's military-drafted constitution. His role was largely ceremonial given Suu Kyi had awarded herself the title State Counsellor and called the shots within her civilian administration. But he was nonetheless the country's head of state and a key domestic ally for Suu Kyi within her party. Speculation had swirled for months about the health of Htin Kyaw, 72, who had recently lost weight and has had heart problems in the past. "Myanmar President U Htin Kyaw resigned on March 21, 2018," a statement on the president's official Facebook page said. His office did not give many details for why he resigned Wednesday, only saying that "he wanted to take a rest from his current duty". It added that a new leader will be selected in "within seven working days". There were no immediate candidates put forward as long term successors, but several senior party names were floated when Suu Kyi took power. 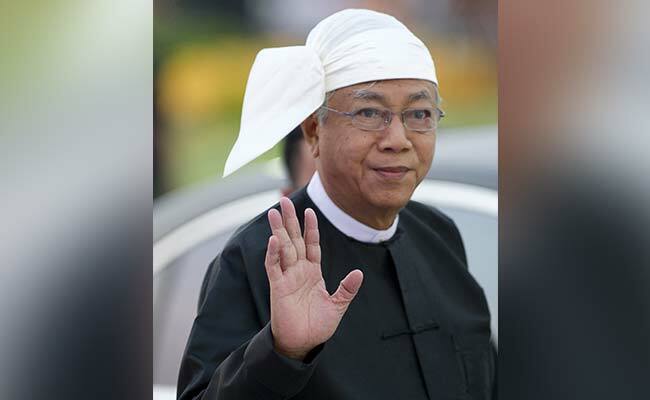 Htin Kyaw, the country's first civilian president since 1962, was widely respected and seen as completely loyal to Suu Kyi's who said she would rule "above" him after he was elected in 2016. He has stood firmly by her side even as as her reputation lies shattered internationally for not speaking up on behalf of the persecuted Rohingya Muslim community. A violent military crackdown has forced some 700,000 Rohingya to flee over the border into squalid camps in Bangladesh, in what the UN has branded as "ethnic cleansing" with possible "hallmarks of genocide". The military justifies its campaign as a legitimate response to Rohingya militant attacks against police posts in August. The civilian government is in a transitional power-sharing arrangement with the army which still retains huge political and economic power. The army controls three key ministries - home affairs, borders and defence -- effectively giving the army a carte blanche to conduct any security operations it chooses. It also has a quarter of legislative seats reserved for officers, giving the military a de facto veto over any constitutional change. Defenders of Suu Kyi say her government's hands are tied by the military but critics maintain it could and should have done more to speak up against alleged army atrocities, particularly in Rakhine State. Htin Kyaw is the son of a revered poet and helped run Suu Kyi's charitable foundation before taking over the presidency. According to an official biography, Htin Kyaw studied at the University of London's Institute of Computer Science from 1971 to 1972. In a varied career he worked as a university teacher and also held positions in the finance and national planning and foreign affairs ministries in the late 1970s and 80s before retiring from government service as the military tightened its grip.